Without resorting to verisimilitude, he is now able to align the painted space with the space that lies outside. At one point in his life, Ahmed explored the coexistence of representational elements and evacuated the surface area of the painting. If he showed an apparent allegiance to academic realism in his representation of the real elements, the readers should be aware that the same artist treated the surface as a positive field of vision, which is considered as negative space in the academia. Space is usually considered neutral, but at the behest of this young painter, the same element has created an opportunity to render it as neural. Though as an artist, Ahmed seems to avoid the extremes of expressive potentials, he always does settle for a middle ground. Alliance Française de Dhaka (AFD) organized the seventh solo art exhibition by artist Kazi Sayed Ahmed titled Surface as Symbol at its gallery in the capital’s Dhanmondi area. 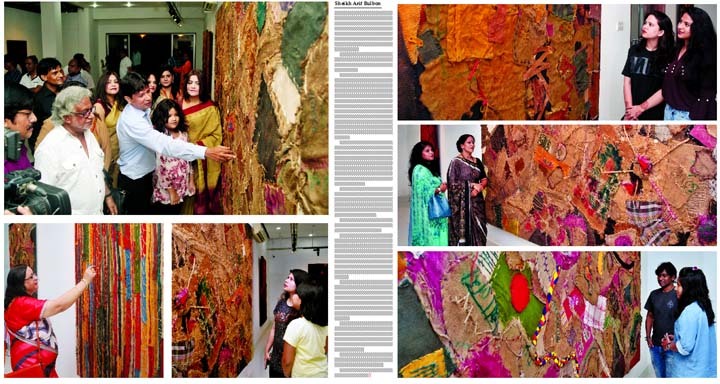 Eminent artist Monirul Islam inaugurated the exhibition as the chief guest on August 31. Reaz Uddin Al-Mamoon, Managing Director, Epyllion Group also attended the ceremony as the special guest while Dewan Sayeedul Hassan, Joint Secretary, Ministry of Road Transport and Bridges also attended the event as the guest of honor. Over the last five years or so, artist Kazi Sayed Ahmed has moved on to a higher plain - he is now inclined to make the best use of his arsenal. His ‘surface’ now appears as if it is the ‘field of action,’ rather than vision/visualisation. Articulating their distance from the reality and lived experience, his surfaces are more layered, and are freighted as symbols of lost time and of disappearing nature. There are around nine artworks in mixed media are on display in the exhibition.